An outstanding device created with the help of controlled molecular manipulation is the scanning quantum dot microscope. This microscope is a non-contact AFM to the tip of which a molecular quantum dot is attached. The molecule is placed on the tip by controlled lifting from the surface. Remarkably, the molecule stays in a configuration vertical to the tip surface where its frontier orbitals are electronically decoupled from the metal tip. In this configuration the molecule has the properties of a quantum dot. It can be gated by applying a bias voltage to the surface and charged with a single electron. The principle of scanning quantum dot microscopy is that this gating can also be the result of electrostatic potentials of nanostructures on the surface. 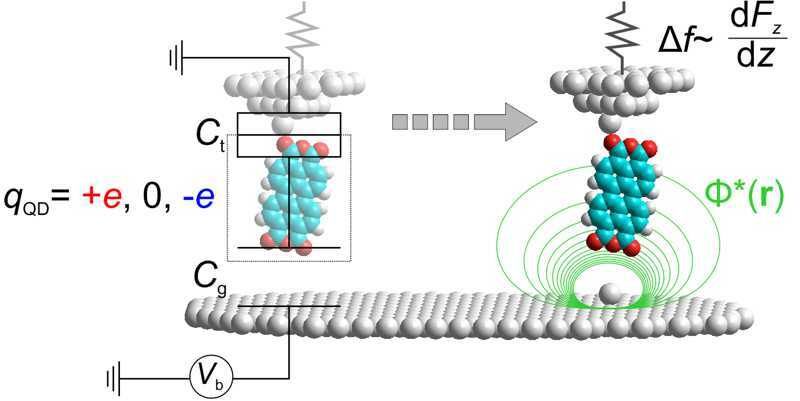 Depending on the sign and magnitude of the nanostructure’s electric potential more or less bias voltage is required to change the charge state of the molecular quantum dot. The abrupt change of the charge state can be detected in the non-contact AFM frequency signal. SQDM is a very sensitive method to image electrostatic surface potential with unparalleled lateral resolution and/or speed.